February 02, 2019 - Dubai, UAE: Registration for the Nad Al Sheba Sports Tournament’s futsal and volleyball qualifying will come to a close this Tuesday and the organising committee has urged interested teams to hurry or risk disappointment. The registration for the qualifying tournament, which opened on January 16, will close on February 5, but teams will have time until February 12 to register their players. The futsal qualifiers will start from February 26 at Al Manara Indoor Sports Hall in Umm Suqeim, while the volleyball qualifiers will start on March 4 at Nad Al Sheba Sports Complex. Organised by Dubai Sports Council (DSC) under the patronage of His Highness Sheikh Hamdan Bin Mohammed Bin Rashid Al Maktoum, Crown Prince of Dubai and Chairman of Dubai Sports Council, the Nad Al Sheba Sports Tournament is the biggest event of its kind in terms of participation and prize money. It is held every year in the Holy Month of Ramadan since 2013 and almost 25,000 athletes have taken part in the competition over the past six years. Last year, more than 5,000 athletes took part in the Nad Al Sheba Sports Tournament, which saw competition in 11 different sports. The tournament also went international in 2018 with a five-a-side futsal competition taking place in the Egyptian capital Cairo and an eight-team volleyball tournament in Amman, Jordan. For teams interested in participating in the futsal qualifiers, their team manager should first decide on a name for his team and then visit the tournament website, www.nasst.ae, to open an account for his team under that name. In case they want to participate in the name of a government entity or company, they will have to provide a letter from the organisation’s relevant department approving their participation in the NAS Sports Tournament. To get in touch with the technical committee of the tournament, futsal teams can send an email to nasfutsal@dubaisc.ae or call +971565759967. The technical regulations of the futsal qualifiers stipulate teams can register not more than 16 and not less than 12. Holders of UAE and Comoros Island passports, with valid resident visa in the case of the second, will be considered as local players along with players whose mothers are Emiratis. Teams can also register two players who are born in the UAE as local players and two who are residing in the UAE. Further stipulations state that a futsal team can have only four players who are registered with the UAE Football Association, and only three of them can be on the pitch at the same time. The rest of the players should not have been registered with the UAE Football Association as football, beach soccer or futsal players in the last three seasons – 2016-17, 2017-18, 2018-19. Teams who qualify for the main stage of the NAS Sports Tournament are entitled to recruit no more than three foreign players, but only two of them can be on the pitch at the same time. The foreign players can be registered up to 48 hours before the start of the tournament. All the required forms for the futsal player registration are available on the tournament’s official website. The process of registration for the volleyball team is the same as futsal. After choosing a name for his team, the team manager should visit the tournament website, www.nasst.ae, to open an account. In case they wish to participate using the name of a government entity or company, they will have to provide a letter from the organisation’s relevant department approving their participation. Teams taking part in the volleyball qualifiers can register a maximum of 14 players and a minimum of seven. Players who hold UAE passport or Comoros Island passport with a valid resident visa will be considered as local players along with those whose mothers are nationals. 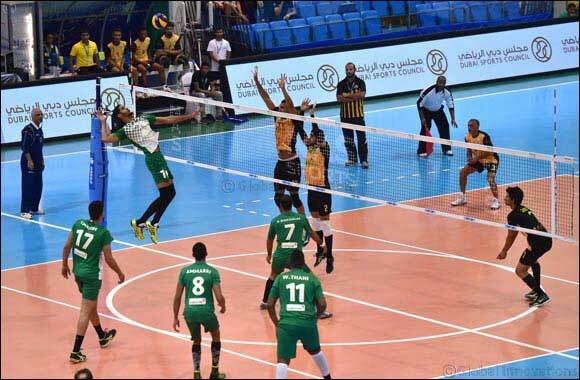 Each team is allowed only four players who are registered with the UAE Volleyball Federation, and only two of them can participate in the match at the same time. All the players need to aged 18 and above and the documents required for player registration are the same as the futsal players. For more information on the volleyball qualifiers, interested teams can contact via email on nasvolleyball@dubaisc.ae, or call on +971565759968.